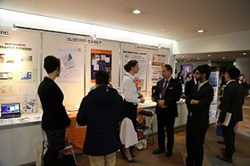 The World Bosai Forum/IDRC 2017 in Sendai has finished with a big success, thanks to various contributions from the session organizers, exhibitors, poster and flash-talk presenters, invited speakers, and other participants including local citizens. More than 900 registered participants from over 40 countries and regions – many more if we include the public audience to the Forum sessions – have gathered at the Forum. Many of the Forum participants also participated in the study tours and excursions to learn about and experience the areas affected by the 2011 Tohoku disaster. 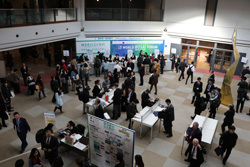 Including the visitors to the related events (Bosai Kokutai – National Conference on Promoting Disaster Risk Reduction 2017, and 2017 Bosai Industry Fair in Sendai), the total number of visitors was approximately 11,200 during the four days! 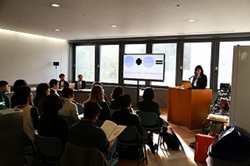 In the Forum, we have shared the findings and experiences about the 2011 Tohoku disaster, and discussed practical solutions and new international attempts toward "Bosai" for promoting the Sendai Framework for Disaster Risk Reduction. It was encouraging to see various contributions in diverse topics from different backgrounds, including those from citizens and the young generation and discussions on dissemination of culture. I deeply thank all the participants and supporters who contributed to create the Forum to be a fruitful occasion toward disaster risk reduction. In the closing session of the Forum, Chair's Summary was presented. It summarized the discussion and conclusions of the sessions held during the four days, along with the future perspectives. 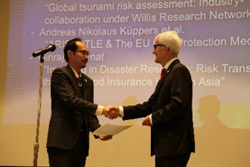 It contains three sections for Science and Technology, Policy and Finance, and Society and Culture, and also mentions key items of the Sendai Framework for Disaster Risk Reduction such as "build back better" and development of a "risk culture". 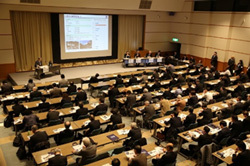 The World Bosai Survey aims to illuminate attitudes towards disaster risk reduction of both bosai specialists and citizens, asking questions in relation with the Sendai Framework for Disaster Risk Reduction, 2015-2030. We believe that a survey of this kind would be the first trial at the global level. Looking back at the path from the Great East Japan Earthquake, people from the younger generation in Iwate, Miyagi and Fukushima prefectures gave presentations on their Bosai activities in the first part of the festival. 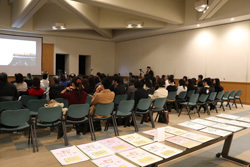 The presentations were followed by a panel discussion including experience and knowledge gained from the Kobe Earthquake in 1995 and views from Kuroshio Town, Kochi Prefecture, which is preparing for the anticipated Nankai Trough Earthquake. In the second part of the festival, we had a Tiger Dance of Namiita, a folk art performance in Kesennuma, Miyagi Prefecture, one of the disaster-affected areas, to express our gratitude for the support we received from within and outside of Japan at the time of the Great East Japan Earthquake. 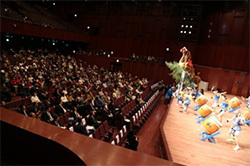 The subsequent "Wish for Recovery" Concert consisted of performances by the Sendai Philharmonic Orchestra members and NHK Childrens' Choir. Involving the audience, we sang together "Hana wa Saku" (Flowers Will Bloom) to conclude this festival. 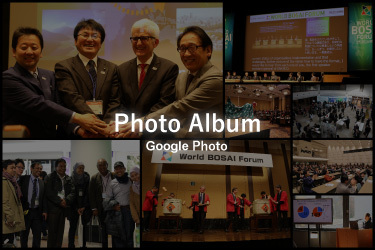 Recognizing the importance of cultural aspects of Bosai, the Pre-WBF festival aimed to pass down the disaster experiences to the future and to the world. The festival made a deep impression on the audience. 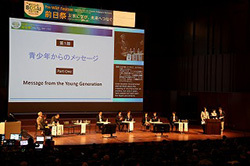 The WBF - Bosai Kokutai joint opening session raised expectations for creating new value through making the best out of the opportunity for collaborating. 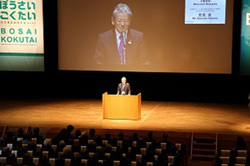 In the subsequent Forum opening session, speeches were made by high school and university students who are living despite the hardship toward the future after having lost their loved family members. Touching on their experiences, they talked about their determination for the future. 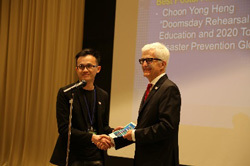 Dr. Robert Glasser, the Special Representative of the UN Secretary-General for Disaster Risk Reduction, gave remarks of acknowledgement for Japan's commitment and leadership in disaster risk reduction, and expectations for the Forum to be one of the key global platform conferences in this field. We held 49 meeting sessions including 16 free open sessions and 33 general sessions. 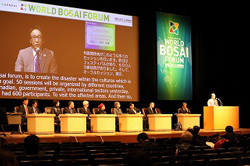 Bosai was proactively discussed among participants from a broad range of perspectives. A total of 93 posters were presented. 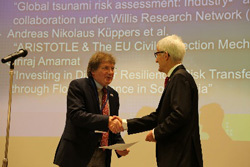 The topics varied from research findings related to disaster risk reduction to practical efforts for disaster risk reduction in industries and others. 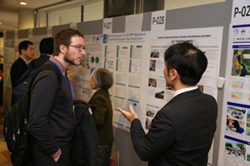 During the core time, presenters held active discussions with attendees in the poster area located on the foyer on the 3rd floor. The Poster Awards, sponsored by Fuji Technology Press LTD, were granted to the following posters. The following 12 organizations/groups presented their activities at their exhibition booths. 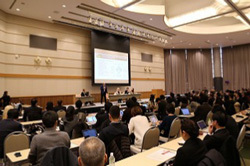 The Iwate Nippo Co., Ltd.
A total of 27 presentations were given by researchers, high school and university students, companies and citizens. 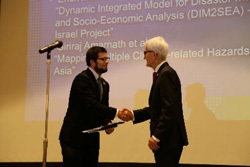 They each discussed various disaster-related topics in 12 minutes. The area used for the flash talk presentations was close to a free open space, which prompted Forum participants to stop by and hear the presentations. The presentations were video-recorded and are scheduled to be posted online. 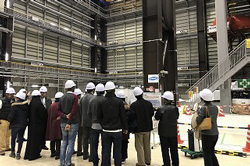 Sendai City organized study tours and excursions for the Forum participants in partnership with Aomori, Iwate, Miyagi and Fukushima Prefectures. 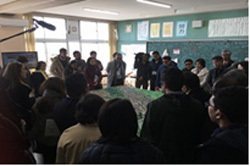 The tours provided the participants with an opportunity to learn about the progress in rebuilding from the disaster and people's efforts for disaster risk reduction in Sendai City and surrounding areas. Through excursions, the participants not only learned the current status of reconstruction but also experienced the diverse charm of the Tohoku region such as its nature, history and food. The study tours and excursions were attended by 171 people from 30 countries and regions. *The numbers in the brackets show the number of participants from each country. The report in PDF format includes detailed information about the Forum.